Philippines’ Duterte thanks Putin for weapons aid – Royal Times of Nigeria. Philippine President Rodrigo Duterte today thanked Russian leader Vladimir Putin for shipping weapons to his struggling military, adding that he will buy more Russian arms in the future. Duterte said the military “was delighted at the weapons” in remarks translated into Russian. Duterte last year threatened to sever defence ties with the United States following criticism from the administration of former US leader Barack Obama over his crackdown on drugs, which has seen police kill thousands of people. However relations warmed under the presidency of Donald Trump. The Philippine military in October declared an end to a five-month battle in the southern city of Marawi where the poorly-equipped army struggled to oust militants loyal to the Islamic State group. “These are high-precision weapons. We had to lead a new type of warfare, we had to fight snipers… we were fighting back house-by-house. That’s not so easy,” Duterte told Putin. 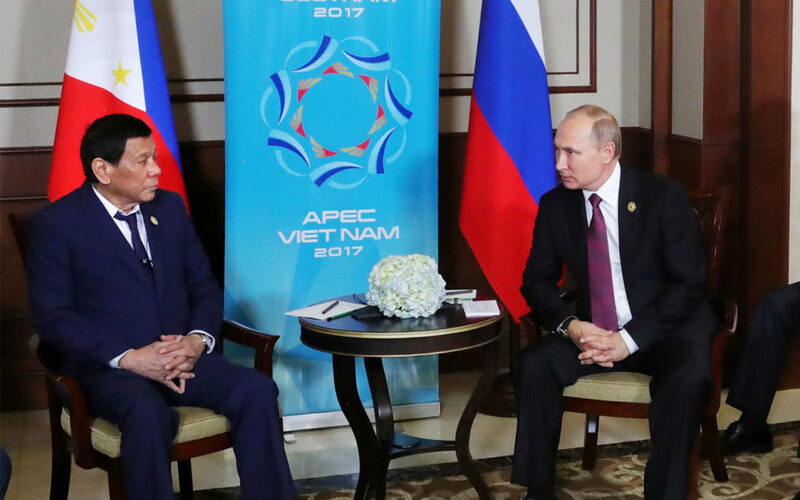 In a reserved response, Putin said that “weapons are important” but Duterte’s “readiness… to fight the threat of terrorism” is even more significant.